Did ecological impropriety lead to the end? The recent discovery of pieces of the world's oldest ocean-going ships off Ras Al Junaya on the coast of Oman by a team of Franco-Italian archaeologists, provides more proof of the glory of the Indus Valley civilisation, which flourished in Pakistan and northwestern India from 2500 BC to 1700 BC. The ship was in fact a large reed vessel, about 20 m in length. Though the find confirms the trade links of the Harappan civilisation, it doesn't shed much light on how it came to an end. Several theories have been postulated about the demise of this ancient culture. They include being wiped out by Indus floods or invading Aryan armies, put forward by archaeologists such as Mortimer Wheeler, B K Chatterjee and Vijay Kumar in the 1950s and 1960s, but these have been debunked. Historians generally agree now that the death of the Indus Valley civilisation was not caused by a single dramatic event; it was, instead, a slow decline attributable to a combination of factors. B K Thapar and Pakistan's Rafique Mughal maintain, for example, the gradual drying up of the Ghaggar-Hakra river system, the destruction of forests and intensive grazing in the Himalayan foothills resulted in erosion and the sedimentation of water channels. Vishnu Mittre, W A Fairservis and Kenneth A R Kennedy blame the decline on the drying up of riverbeds, increasing soil salinity and widespread deforestation. Robert Sharer, on the other hand, argued in 1979 that shifts in ancient trade routes caused Harappan cities to lose their key commercial role. But investigators in the 1980s suggest that the first urban civilisation on the subcontinent came to an end around 1700 BC because its numerous small settlements grew beyond their natural limits, leading to overuse and mismanagement of natural resources. Water requirements of the Harappan settlements were conditioned by the vagaries of the Indus, on erratic rainfall and the inexorable drying-up of the area's main water source and so the Indus Valley civilisation was forced to survive on irrigation. Ironically, this instrument for survival may have become the cause for the civilisation's destruction, say researchers such as Shereen Ratnagar of Jawaharlal Nehru University, who proposed in 1986 that lift-irrigation may have resulted in an over-reaching of its ecological limits. The political and economic power of the Harappans is known to have been based on their successful agriculture and vast stores of grain. But Ratnagar insists that their thriving agriculture was not based on suitable, natural conditions, as was previously believed. Belying assumptions put forward in standard Indian textbooks, the Indus river may not have been a dynamic factor in the growth -- and subsequent destruction -- of Harappan agriculture because the Indus alluvium was not conducive to intensive farming. 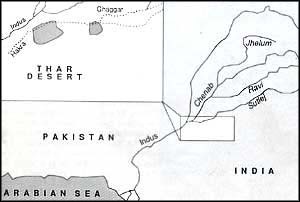 Other settlements have been found in Sindh-Kohistan, beyond the western edge of the Indus alluvium, in an area with reliable spring-water. Ratnagar contends that unlike the Nile and the Euphrates, rivers that spurred the growth of other ancient civilisations, the Indus "is an unpredictable, immensely destructive river." While the annual discharge of the Nile is 83 billion cubic metres and the Euphrates, 24-30 billion cubic metres, the Indus discharges 207 billion cubic metres, but is also highly variable. Its lowest discharge is 20,000 cusecs and occurs in March at Sakkar in north Sindh, peaking in August at 400,000 cusecs. Heightening the destructive effect of this enormous amount of water is the river's steep flow. The Indus has a gradient of 1:5,000, as compared to 1:2,000 for the Nile. During the monsoon, vast amounts of water flow in from five other rivers -- Sutlej, Ravi, Chenab, Jhelum and Beas -- and the swollen Indus begins changing its course unpredictably. Unlike the flooding of the Nile, which recurs with clockwork regularity, there is no uniformity to the Indus' flooding. It may rise only marginally in some years and then sweep away the crops in devastating floods in other years. All this meant the Indus could not be depended upon to water the crops of Harappans living on its alluvium, nor could irrigation canals be made to tap the untamed Indus. Furthermore, because standing water in the fields would have receded by December and winter rains are also unpredictable, lifting water from the ground for irrigation would have been a necessity. In the large area occupied by the Harappans, the most reliable river to serve their water needs would appear to have been the Ghaggar-Hakra on whose bans are located the densest of the Harappan settlements. However, the Hakra did not carry much water and Pakistan's Mughal suggests that the Harappan civilisation came to an end with the drying-up of the Hakra about 2500 BC. Harappans in this area therefore welcomed the winter rains and also drew on aquifers. After the summer inundation of the Ravi subsided, they must have used wells to supplement irrigation. Though the Sutlej has changed course slightly since the Harappans it was known even then to be difficult to control, not useful for irrigation and of use mainly for trade purposes. But the theory that the Harappan civilisation was swept away by raging Indus floods also has been debunked. Ratnagar and Mark Kenoyer of the University of Wisconsin argue, "As the river was known to be violent and unpredictable, how could the Harappans have been taken unawares? They must have always been prepared to move out when it began flooding." The break-up of the Indus civilisation was probably not brought about by some dramatic event, but through a combination of natural conditions and the over-use of resources. Lucknow University's Vishnu Mittre notes the pattern and volume of rainfall in the Indus Valley region have remained largely unchanged. Most of this arid and semi-arid area receives deficit rainfall for both the rabi and kharif crops of barley and wheat, the staple food of the Harappans. The crops were fed by winter rain, which was not heavy but came at a crucial time, and by the monsoon. The Harappans, presumably, would have had to fall back upon lift irrigation for rabi cultivation. The Harappan civilisation appears to have spread to areas with reliable groundwater. The Rann of Kuchch, for instance, has no major river, but some major Harappan sites, such as Dholavira, have been found there in areas watered by natural springs and sub-soil water. The level of aquifer groundwater in Kuchch must have been higher then, thanks to the Luni and the now-dry Saraswati. The water must also have been sweeter and less saline. In Baluchistan, which has a short rainy season, gabarbands (stone dams) have been built along mountain slopes to hold water and nallas or gullies were used to direct the water. Thus, while some small canals were made to divert water and other areas were sheet-flooded during the monsoon, natural irrigation was heavily supplemented by drawing groundwater from artesian wells. The Harappan form of lift-irrigation is a complete contrast to the systems operated by the ancient Egyptians and Mesopotamians. Lift-irrigation is extremely labour intensive and depends on animal power, says Ratnagar, and so "lift-irrigation would severely limit the area any farmer could cultivate. Harappan settlements are, therefore, much smaller than their counterparts in other ancient civilisations." Cattle that the Harappans would have used for irrigation and ploughing need much water and fodder. W A Fairservis of the American Museum of Natural History in New York, pointed out in 1967 that the fodder requirements of the Harappans could only have been met by allowing cattle to feed on acacia, kandi and poplar grown on the outskirts of settlements, or by fodder grown on part of the agricultural land. The Harappan pattern of agricultural production could meet the settlements' increasing demand for grains only through ruthless exploitation of the vegetation cover. M H Raval, former director of the Gujarat department of archaeology, suggested in 1989 that as animal herding was an important form of subsistence in Harappa, large populations of goat and sheep would also have led to overgrazing. Such over-extension of natural limits is believed to have resulted inevitably in the breaking up of the Harappan settlements. The seemingly clinching piece of evidence of this ecological destruction theory is that the Indus Valley civilisation was a Bronze Age culture, which began in 3000 BC. Enormous quantities of wood are needed to make copper and bronze and Ratnagar maintains that this would have devastated the surrounding forests. A temperature of 1084oC is required to melt copper and the furnace must be stoked for 12-14 hours. Even using the simplest smelting techniques would mean burning 700 kg of wood to produce 20 solid axeheads. Wood consumption was also needed to produce jewellery made of glazed faience (sintered quartz), which has been found extensively in the area, and to bake bricks, pottery and stoneware. The Harappans used timber to make boats and furniture for export to Mesopotamia. Observes Kenoyer, writing the epitaph of a glorious civilisation, "The Harappans were obviously not environmentally conscious. Like anybody else, they thoughtlessly hacked and used the rich forests."